SoundPress.net: The Eagles: Once and Future Kings of Country Rock? The Eagles: Once and Future Kings of Country Rock? They are a group who were at the forefront of pioneering the hybridization of country and rock music and they first became famous hitting radio gold by singing about Winslow, Arizona. 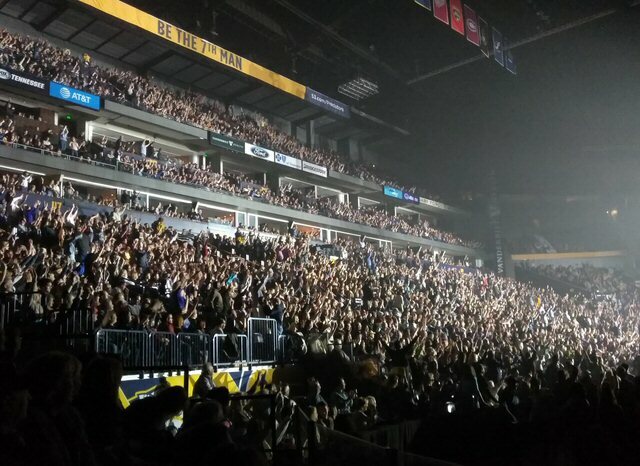 But on Friday, March 23, 2018 we watched as the Eagles overcome their recent tragic chapter to rise like a phoenix when they began a sold-out two-night stand at the Bridgestone Arena in Nashville, Tennessee. From our vantage point in Section 120 of the home confines of the Nashville Predators we were able to observe a tour rep deliver a set list to a local reporter. The older gentlemen gushed to the young writer about the prowess of the band's newest members Vince Gill and Deacon Frey. He proudly reported to her that the young son of the departed Rock n Roll Hall of Famer's first gig was in front of 40,000 before adding, "there's a youth movement in the band and this music will still be going on long after we're long gone." He's not wrong. In our time on the scene we've covered YES fronted by two singers not named Jon Anderson. Same for Journey where the beloved frontman replaced was the iconic Steve Perry. We've seen Styx carry on quite well and determined without Dennis DeYoung. KISS continues with Ace's former guitar tech playing his role. The spirit of Jerry Garcia now lives on in John Mayer. We've been in attendance for half of The Who. We also once watched a debacle that was one fifth of the classic Sweet line-up trying to mount their case for band as brand. It doesn't always work but often it does. Frey's death was one in a slew of leaving that also bid adieu to Prince and David Bowie in quick succession. Humans beings can be frail and fragile and all of our departures are imminent and just as assured as taxes. So, what are rock bands and their admirers to do when faced with these unique challenges that living brings? Fans can either adapt to the new realities or sit out attending what they might call performances by tribute acts. Or, they can wait for the hologram show. In the case of the Eagles - survivors Don Henley, Timothy B Schmit and Joe Walsh - have made the decision to carry on by replacing their co-founder and driving force Glenn Frey with two new guys. It doesn't hurt that the men chosen to take flight in the group are Glenn's son Deacon who is the spitting image of his father circa early 70's and legitimate country star and Nashville homeboy - as Henley referred to him from the stage - Vince Gill. Both thrilled at the Bridgestone. Deacon paid tribute to his dad by singing several of the songs Glenn popularized beginning with "Take It Easy". Another favorite was the laid back "Peaceful Easy Feeling" ending with Glenn beaming down on his son from the big screen. Gill had no trouble winning over the sold-out crowd as he sported a jersey of the local Stanley Cup contenders. Vince fits like a glove and the solo artist is no stranger to fronting a country rock outfit as he rose to prominence with Pure Prairie League riding their solid hit "Let Me Love you Tonight" to the top of the charts. Amy Grant's husband also showed off his guitar chops trading licks with Don Felder look-a-like Steuart Smith and Joe Walsh. He also got a moment to shine when he performed a solo track with the classic rock band that featured an expanded horn and string section at various points in the night. His "Next Big Thing" got us to thinking that the Eagles were trying to tell us something. In any case they were definitely sending a message with the last 45 minutes of the concert and that was - "We have Joe Walsh in our band. He's a rock star and we're setting him loose". More than half of the concert's final seven songs were Joe Walsh tracks. "Walk Away", "Life's Been Good", "Funk #49" and "Rocky Mountain Way" had the Music City faithful up on their feet and rockin' along with reckless abandon as the joyous two-and-a-half hour concert came to a close. Could the Eagles actually become the next big thing in country music? By the end of the show we were salivating at the prospect of a Vince Gill/Joe Walsh fronted version of the band and brand supplemented with the legendary harmonies that were so strong all night long. Talk about a country/rock hybrid! Perhaps they were broadcasting their intentions to pivot more forcefully into the country music market when they played a very special show here back in the fall at the Grand Ole Opry. The Eagles have a long history in the genre and their place of prominence was secured when many stars of country music paid homage to them on 1993's well-received Common Thread album of Eagles covers. There were no Henley solo compositions featured at this outing but that makes sense as he literally has his hands full with singing many of the outfit's hits in addition to playing drums, percussion and serving as de facto emcee. In that role he had to address the fact that our boys are not the little eaglets they once were. "You might be asking what's the deal with Tim;" Henley inquired from the stage about the one time POCO bass player with the famously highly falsetto. Schmit then had to recall how he fell in the shower during a recent tour stop in Chicago that put him in a cast and forced him to remain seated in Nashville. He joked that he didn't really know what happened and he didn't have one of those little buttons to alert anyone that he couldn't get up. He remained feisty however by asking the fans to sing along "if you can" to "I Can't Tell You Why" from The Long Run album. 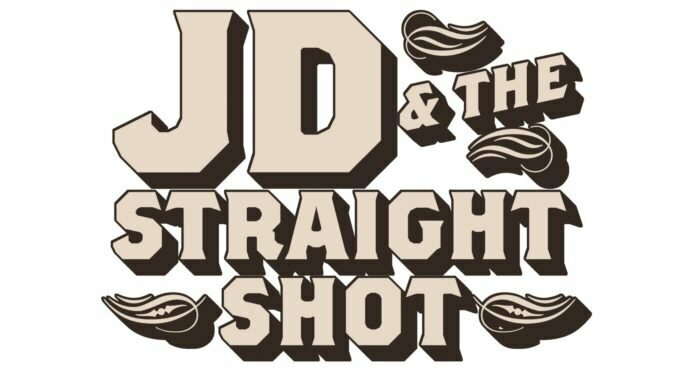 Opening for the high-flying Eagles was the convincing and compelling JD & The Straight Shot. Comprised of New York media and sports executive James L. Dolan and his musical team including guitarist Marc Copely (B.B. King, Rosanne Cash); bassist Byron House (Robert Plant, Emmylou Harris, Dolly Parton), violinist/fiddler Erin Slaver (Martina McBride, Rod Stewart), drummer/percussionist Shawn Pelton (Sheryl Crow, Levon Helm, Saturday Night Live band); and, guitarist Carolyn Dawn Johnson (Miranda Lambert, Kenny Chesney) - the band is aiming straight for the top in 2018 with high profile positioning on tours by the Eagles, Chicago and The Doobie Brothers. The roots, blues and Americana themed collective have transformed into more of an acoustic affair in recent years but they provided a big sound in Nashville that really found its groove on the back to back spiritual warnings of "Perdition" and "Better Find a Church". When they announced a Three Dog Night cover as their last track the crowd responded in recognition and the well-played, vibrant and upbeat "Shambala" earned them their biggest cheer of the night.